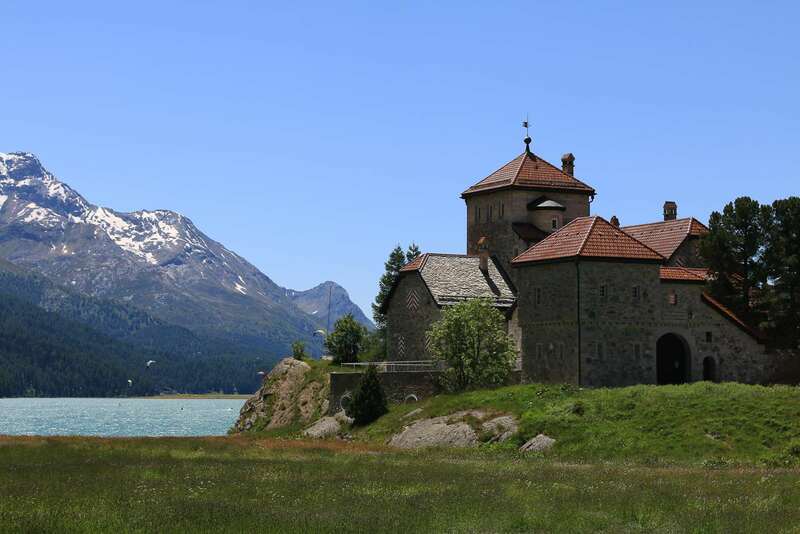 Visit St Moritz in the Upper Engadin Valley in Eastern Switzerland. The abundance of green, tall mountains and the excellent trails put this spot as a must see. 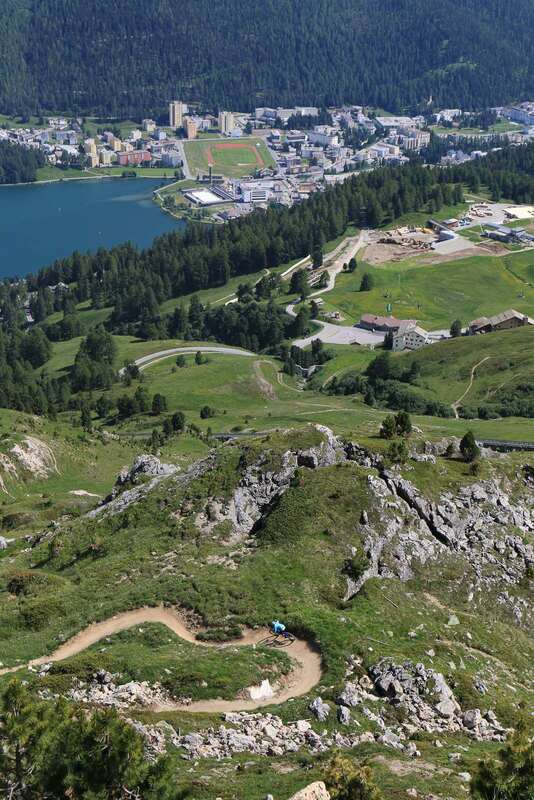 Visit St Moritz in the Upper Engadin Valley, Eastern Switzerland. Home to some of the most spectacular mountain ranges in the world and treat for mountain bikers. I turn left after crossing a creek and climb up between some small farm buildings, following the yellow route markers, loosely following signs to Fex. Starting to roll down the double track, I see another group of small yellow signs, pointing up a small, steep path on my right. Fex is also listed here. The afternoon sun was shining brightly, I had food in my pockets and water in my bottle, so why not try the high road? After a short push up a steep section of singletrack, I got back on and started pedalling. Like many trails in Switzerland, routes typically follow the contours to climb gradually, and avoid going straight up the steep gradients. 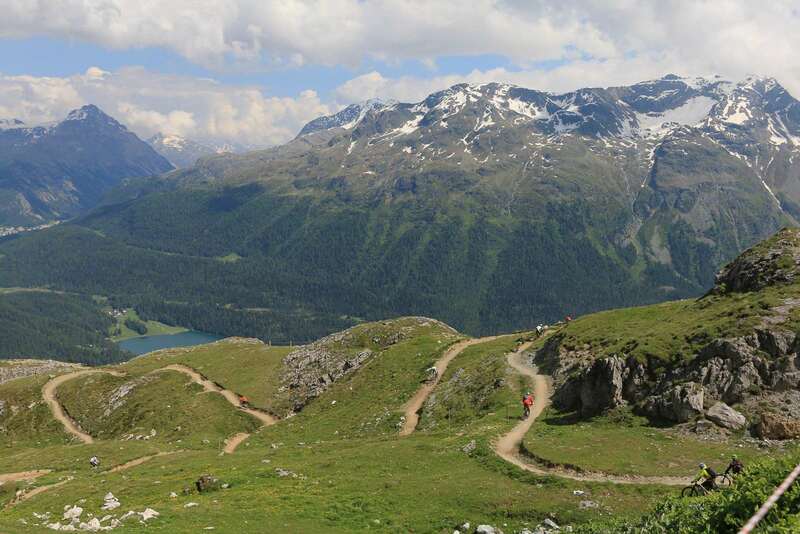 The small trail I'm exploring never quite flattens out, but the climbing is moderate and the views across to Lake Silvaplana and to the Julier Pass are immense. While it's low speed, the trail requires complete attention, it's barely 25cm wide, and there's considerable exposure with a large drop to my left. The snake of trail continues along the slope, etched into the steep gradient as if a giant had scraped their finger nail along the grass terrace that sits above the idyllic alpine valley below. I'm in St Moritz, staying for a week in the Upper Engadin Valley, which lies in Switzerland's largest Canton, Graubuenden – at the East of Switzerland. I've been here before – in the greater region and this one specifically. 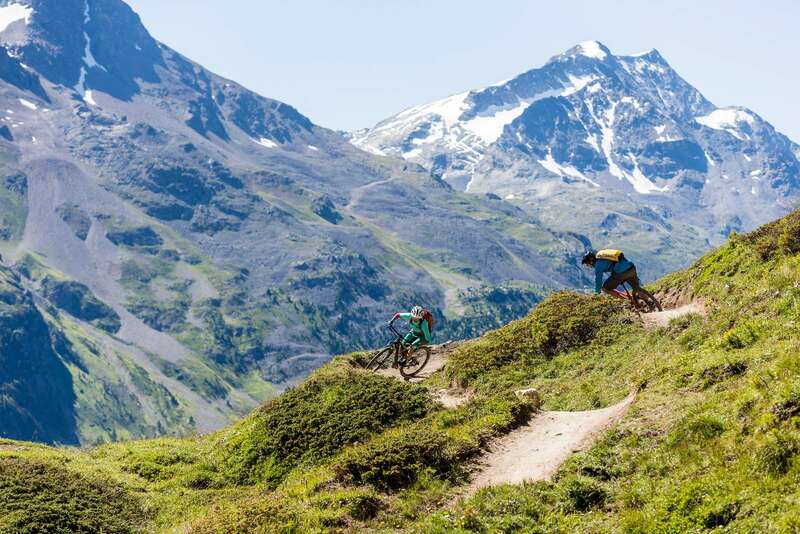 There is incredible mountain biking over the border in Italy, around Livigno, and also down the valley in the Lower Engadin, around Scuol and Tarasp. We even passed through for a story about two years ago – but the volume of mountain biking on offer meant that another visit was always going to be required. Mention St Moritz in most company and your friends will think of private jets, luxury ski holidays, high class living and shopping. All of those things are accurate. St Moritz has a small airport in nearby Samedan that private jets can fly into, and thanks to being at about 1800m, the winter sports season is long, and amazing. The town and area is well-known for hosting the rich and famous, as are many European ski resorts. However, that has little to do with summer. Or does it? 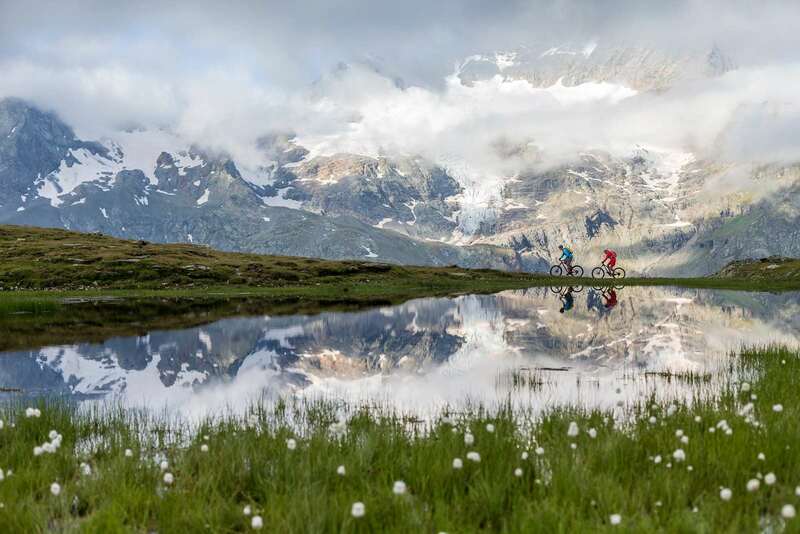 Between St Moritz, Pontresina, Silvaplana, Sils and Celerina, there is not only 400km of marked trails for mountain biking, but also a stunning network of mountain trains and telecabines. There are mountain restaurants and high mountain refuges, and hotels and apartments with comfortable beds. The same infrastructure, and the same mountains, are there in summer, just like winter. Best of all is the climate – known for having well in excess of 300 days of sunshine a year, St Moritz has long daylight hours through summer, with light from about 5am through to 9:30pm, and although the peak temperatures don't often get about 25 degrees, the sunshine is warm. One of the features I look for when researching places to go on a mountain biking holiday is variety. There's a great chance that no matter how much you like rough downhill trails, or long climbs, or tight singletrack – a week of riding one type of trail is going to get physically and mentally tiring. 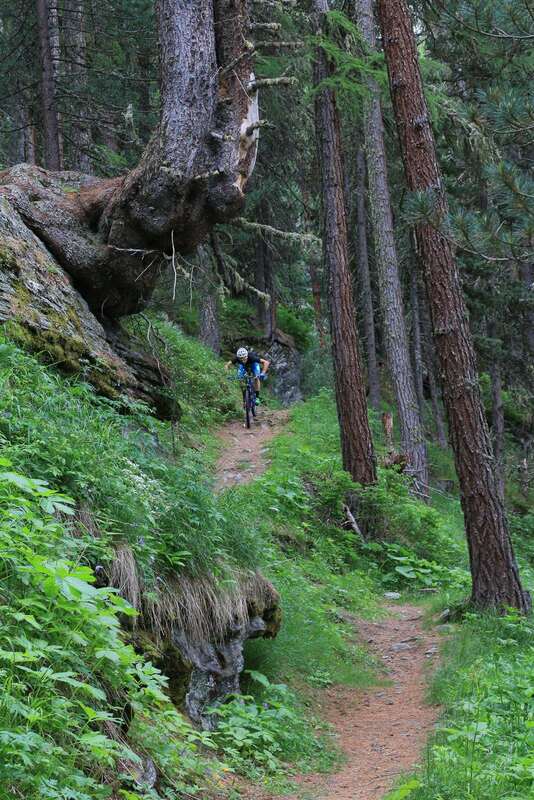 Most alpine areas that have catered for mountain biking for a number of years tend to have variety. From purpose built gravity trails, to easy, flatter trails in the valley, to high trails in technical terrain above the tree line. St Moritz and surrounds are no different. I spoke to Lukas Häusler, who works for Allegra Tourism. They're a trail building company that helps areas set up for mountain biking. He moved to the area from Basel, for the snowboarding, but now it's the mountain biking that keeps him there. 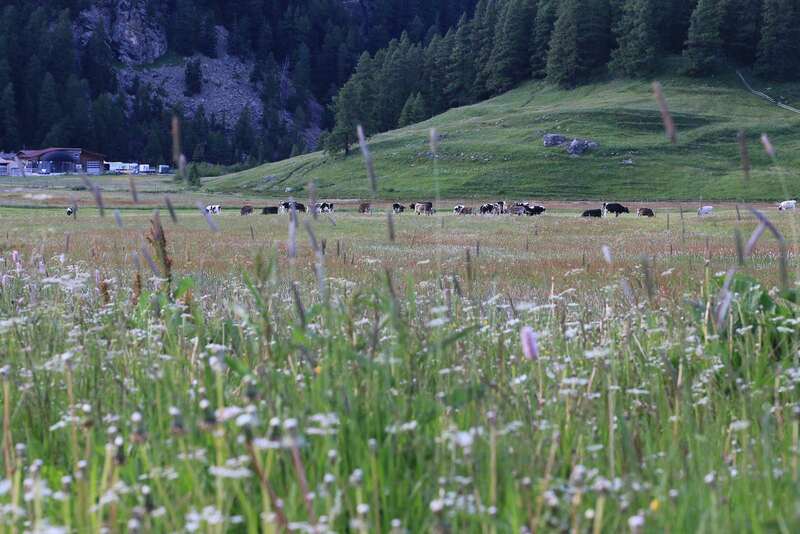 He started working with the company in 2011 to build the Corviglia Flow Trails. But it's not just those trails that attract riders. And that brings me back to my trail above the tree line on the way to Fex. The trail crossed tiny bridges, about the width of two fence palings. It climbed up some rocky steps and then traversed a rock slide. In an alpine environment, things you'd like to be large are small, and most things that present a challenge are large. So it was a small, narrow bridge, or tiny area of flat terrain, before a big rock garden, made up of boulders, where the line was between them, not over them. The trail descended, and with each small rocky drop off I wondered whether the front tyre would hold on landing, or whether I'd slip down the side of the mountain. The lush alpine grasses and wild flowers bordered the thin line of trail ahead, and I could see old summer farm buildings marking the edge of Fex. A few last chutes of perfect alpine singletrack and I came back onto the route I'd started on. My side trip hadn't been a marked mountain bike route, or a well-known trail. But it was truly unforgettable, and just a tiny sample of what was possible in the high valleys around St Moritz. There are three different purpose built flow trails in the area, but the Corviglia Flow Trail is probably the most well-known. 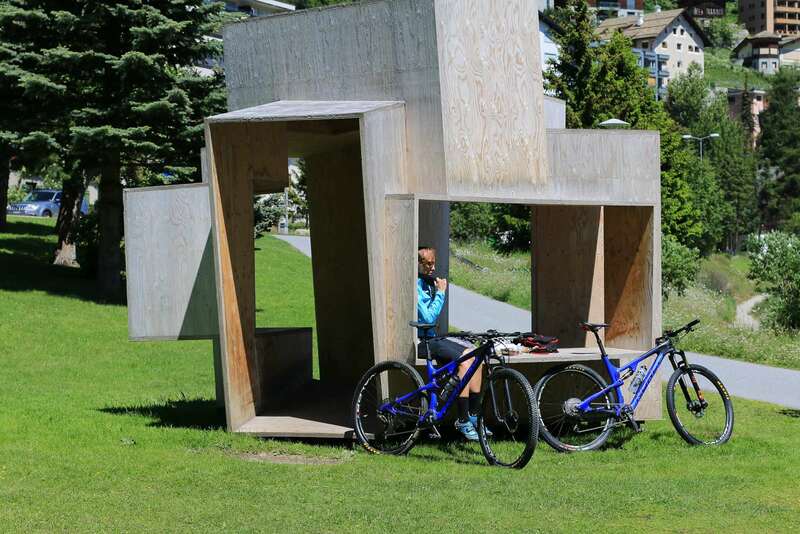 Built into the huge south facing slope above St Moritz, and with easy access by mountain train, the trail is a 3.7km downhill pump track, with huge views across the valley and over the lakes. The trail drops about 500m altitude, and has countless berms and options for doubling some features on the way down. While it is built for everyone to ride, and you can easily ride it slowly with two wheels on the ground, you will find it steeper than flow trails in Australia. It is built onto a serious mountain, and when you're off the brakes you pick up speed very quickly. The builders used the natural terrain and the small terraces in the mountain perfectly, which should give you a chance to get some relief from arm pump on the way down, until you head back to the Corviglia train to go back up. A little different, but from the same station, the WM trail traverses along some high alpine singletrack before descending steeply towards the Trutz Restaurant. You can then link this with trail 672 to the final section of the flow trail, Fopettas, which features more built features. From a couple of ladder bridges, to elevated trail and wooden berms, it is mostly under tree cover and an excellent finish to a long descent from high up the mountain. We visited at the very end of June, crossing into early July. This truly is the very start of summer in high alpine areas. Wildflowers were in bloom throughout the valleys, in the forest, and above the tree line. The air was crisp, and laced with the scent of sweet honey and pine – riding through it is an experience that is hard to describe. Depending on the time of year you visit, you will be able to go up high to Piz Nair. While riding from Corviglia at around 2500m is already well higher than the top of Mt Kosciuszko, after taking the train to Corviglia a cable car will take you to 3056m to Piz Nair. This is a unique experience for Australian mountain bikers. The descent is pretty wild, being quite rocky and open as you are well above the trees, and grass. 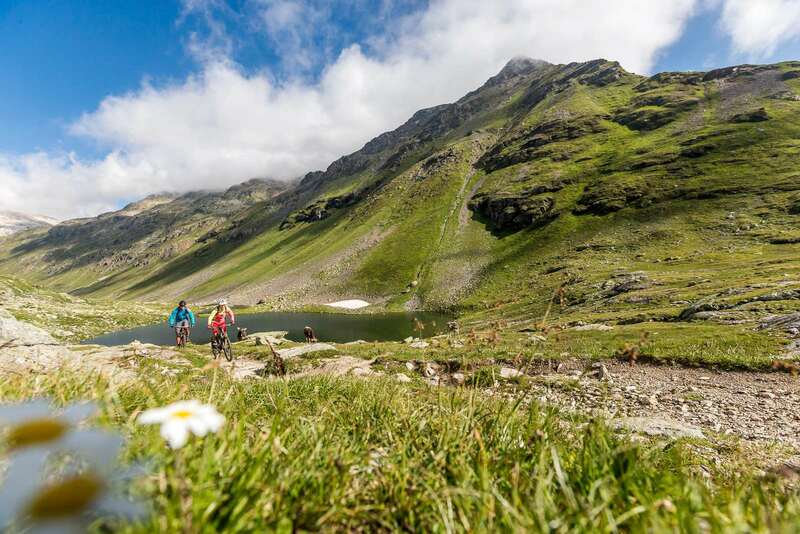 You have views all around, but you might even spot the awesome trail from the Suvretta Pass, which is well worth doing, although you can't access it from here. Follow the route around as it hugs the valley walls, contouring but also dropping sharply at times. Route 672 is below you, but you do join onto it for some more excellent singletrack that looks like it has been carved precisely into the grassy slope. On the other side of the valley, the first cable car of the day from Surlej to Corvatsch will take bikes, so you can descend to the Val Roseg below. You are right under all the 4000m peaks around Piz Bernina. 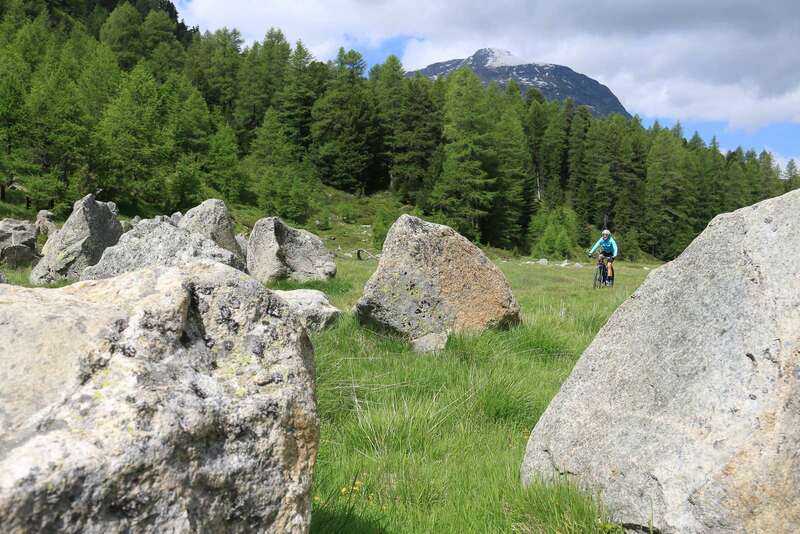 The trail goes down the valley to Pontresina and an easy ride back on the marked bike routes – or a train ride if it's been a bit epic. This is a serious, technical route and probably best kept for experienced riders on quality trail or all-mountain bikes. No matter what way you arrive into the Engadin Valley and towards St Moritz, you will be entering through a pass of unique natural beauty. Whether you climb the sinuous road from Italy up the Maloja Pass, or through the high, rocky valley of the Julier Pass, past the lakes and through the forest on the Bernina Pass, or maybe coming through the quaint towns lower in the valley coming from Zernez – you will understand why the Swiss are so proud of their country. Each town is neat, tidy, and will have a number of Swiss flags flying. While it might seem overly patriotic at home, in Switzerland the flag is not just the emblem for the country, it's part of the nation's brand, and a big part of their pride. Christoph Sauser even incorporated it into a tyre design with Maxxis! So it is fitting that Switzerland has a patchwork of national routes through its valleys, along its ridge lines, and over its passes. There are marked national routes for general cycling, but of course the red sign with the bike up on the back wheel is for mountain biking. Exploring nature is part of the what the Swiss love about their country. The most notable marked routes around St Moritz are 671, 672 and 673 – although National Route 1, the Via Alpina, passes through the valley as it crosses from one side of the country to the other. 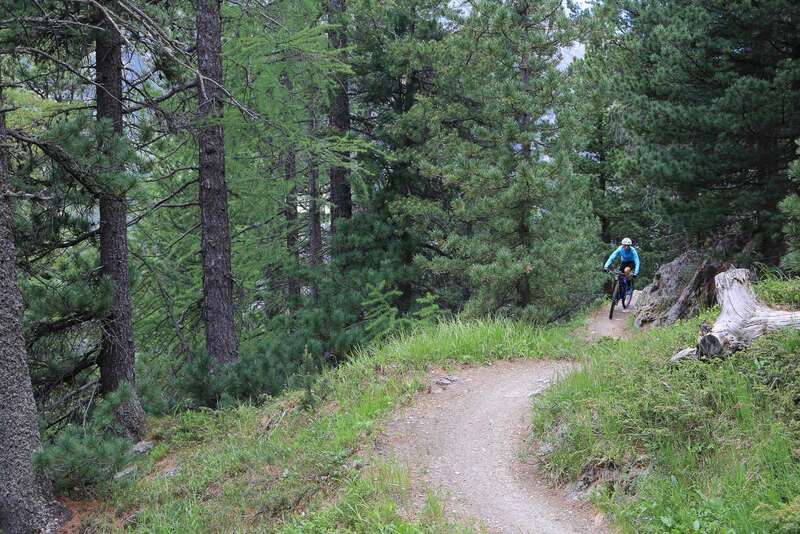 Route 672 is a fantastic loop around St Moritz, taking in some high alpine singletrack, bench cut and fast trails in the forested slopes in God Surlej, and a serious alpine climb to Alp Muntatsch. It's 40km, but with 1550m of climbing, it's a difficult route. Over a quarter of it is singletrack, but the section from Surlej is probably my favourite. This forest continues all the way to Pontresina, and towards the Bernina Pass. It is quite open compared to Australian bush land, and has tall, almost gnarled pine trees, with low shrubs and alpine grasses and wildflowers. There are some small lakes in the terraced terrain, and the gradients are gentle. 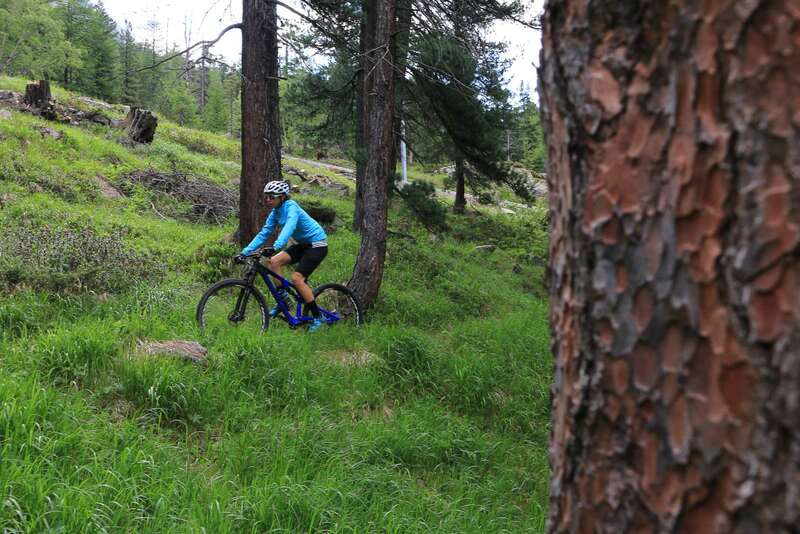 With the huge amount of athletes who come to train in the valley thanks to the altitude, there are countless small trails weaving through the trees. If you don't feel like a big day out in the mountains, you can have a lot of fun following your nose on these trails through the forest. 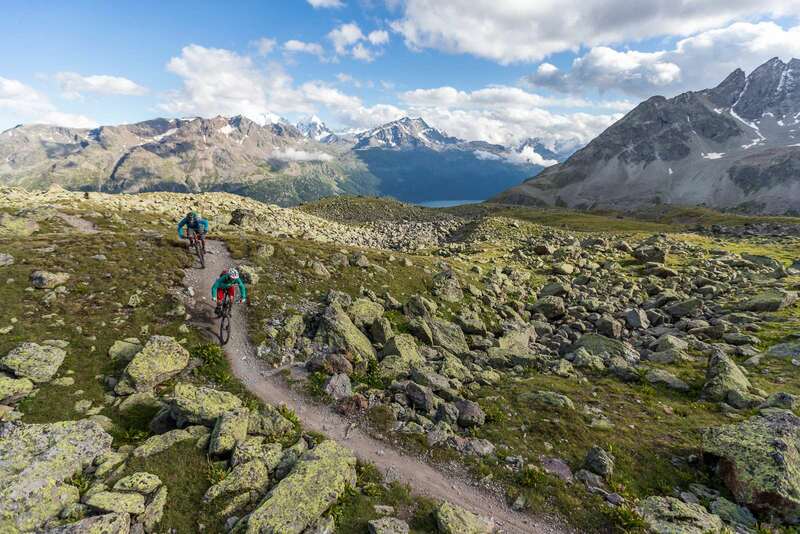 Route 673, the Bernina Express, is a true classic, and it's an IMBA Epic trail. Running from Samedan, the trail follows bike path towards Pontresina, before climbing on singletrack to the Bernina Pass and descending over 1300m to Poschiavo, where you can take a train back. You can even head over another lower pass and drop down to Tirano at 400m! We'll have a full run-down on that trail in our next issue. Personally, Route 671 is one of my favourites. 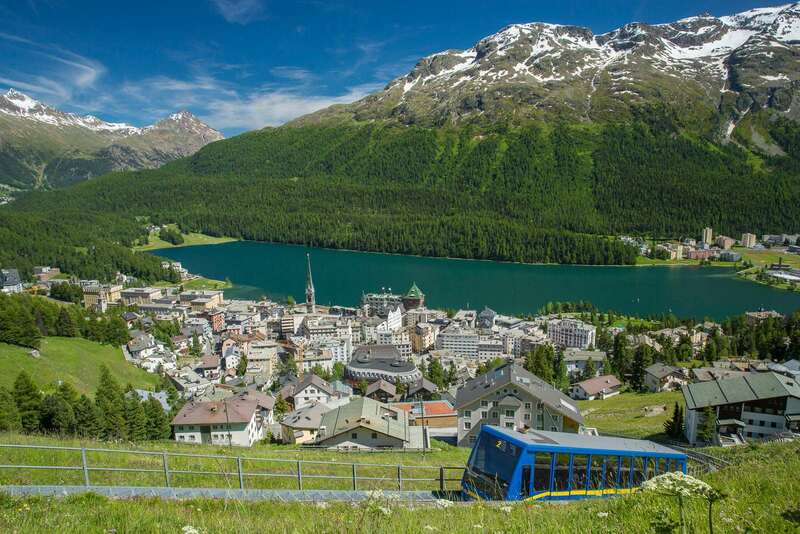 You can start with the train to Corviglia, or ride up from St Moritz. Either way, you need to climb a little more to get to the Suvretta Pass at 2615m. At this point you are actually in one of the few places in Switzerland to have no mobile reception. So sure, take a photo – but you will have to post it to Instagram later. The trail to the pass is often off-camber, and can feel a little exposed at times. But from the pass you really are in quite a narrow, isolated valley. 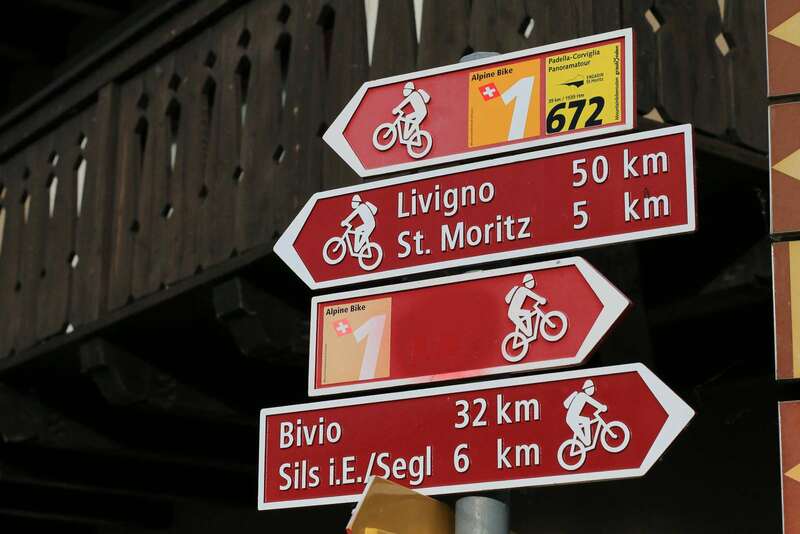 The first 500m of descent (in terms of altitude loss) is demanding, but once you're at Alp Suvretta you can pry your hands off the bars for the gentler trails all the way to Bever, where you can follow bike routes home – or stop off at a restaurant for a well-deserved meal and drink. 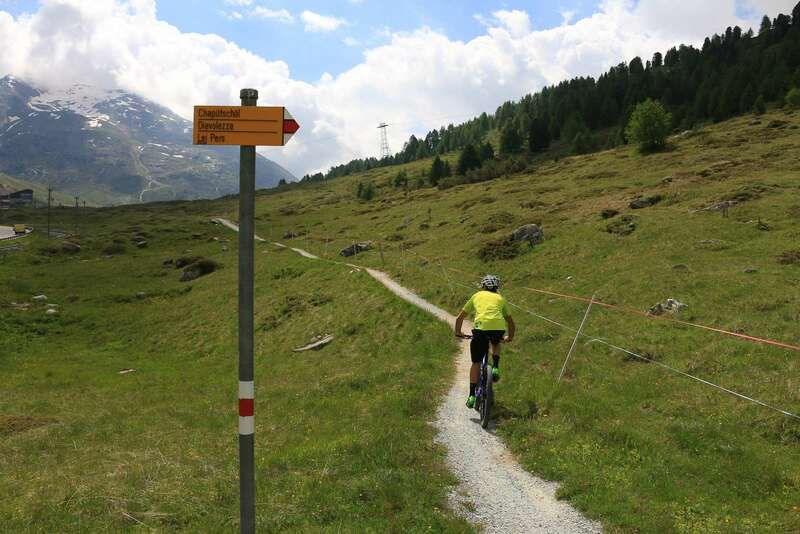 The Upper Engadin, and Switzerland in general, is covered with marked bike routes. Trail descriptions are online, you can download the .gpx file, get a map from the tourist office, and look up the Graubuenden trail app. Or, you can just follow your nose. Sometimes, my greatest rewards on my mountain bike have come from exploring, following trail signs, and being equipped to deal with whatever comes. These kinds of escapades have seen me scaling snow slopes with my bike, and they've also seen me arrive in a different country at a much lower altitude than I expected. It has left me isolated and sometimes on a bus back home after riding too far in one direction – but it has also developed a deep respect and understanding for the mountains here and how the valleys interconnect. Heading out and exploring also took me to places like that high alpine singletrack on the way to Fex. Explore - you will be rewarded. Every trail is open to mountain bikers unless it is specifically forbidden. The Swiss love getting out into the mountains and enjoying the natural environment and that is why the trails are there, having been carved into the hillsides by decades, and in some cases centuries, of use. We covered a real variety of riding while in the Engadin Valley. But we didn't cover everything. We left knowing that again, we would have to come back in the future, to ride the trails we couldn't get to, and find those that are still waiting. There’s plenty to do if you are in the Engaind Valley for longer and don’t want to ride all the time. The mountains are very popular for hiking with numerous routes to high peaks, mountain lakes and view points. But, if you just need to relax you would be best served booking some time for wellness. The combination of a sauna, spa, steam room and maybe a massage is the perfect way to relax, unwind, and revitalise for more time in the great outdoors. Most hotels have wellness, or if you’re staying in an apartment you could visit the new Ovaverva Spa and Pool. With a 25m indoor pool, Finnish sauna’s, massage, separate women’s steam room, water slides and more there’s something for anyone who might visit. Return flights to Zurich from most Australian capitals can be secured for as little as $1350, depending on your travel dates and when you book. 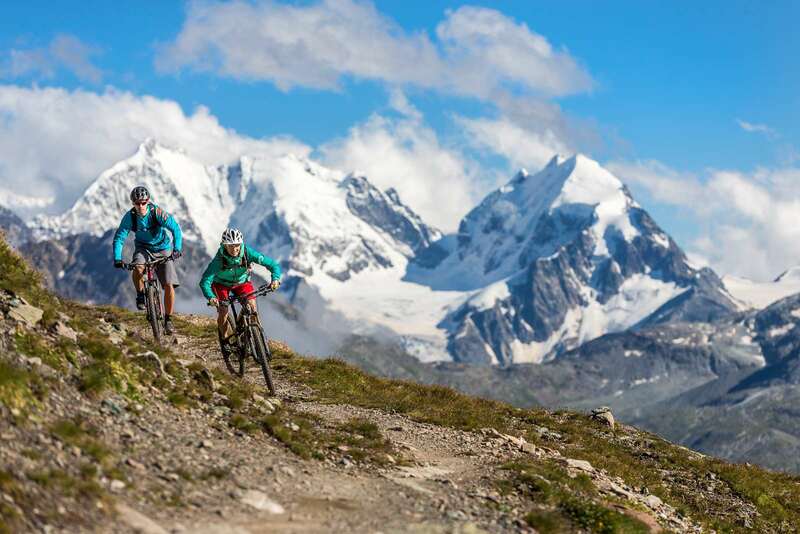 There’s a lot on, but for mountain bikers the picks are the Engadin Bike Giro, a three day stage race in early July, and the National Park Bike Marathon is nearby in late August. But the real beauty of the area is that you don’t need an event to find the trails and enjoy them – just get out and ride! There are plenty of options, from a youth hostel through to true five star luxury. 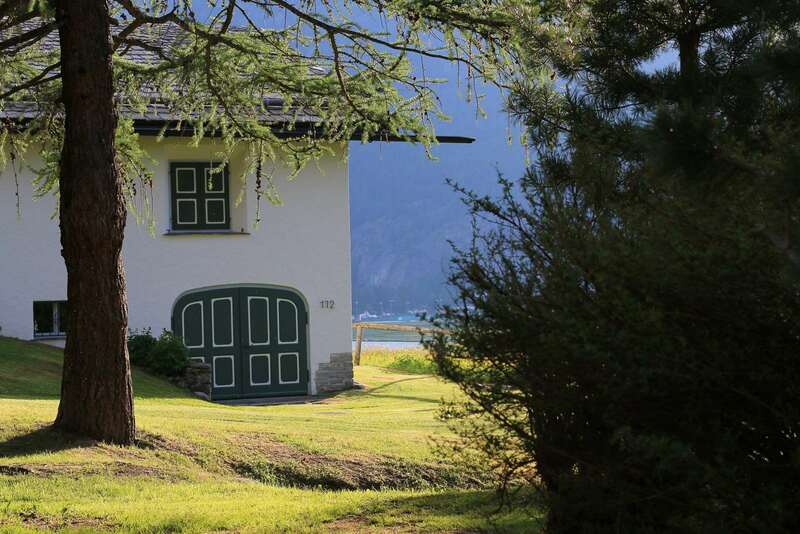 But if the Kulm hotel isn’t quite what you’re after, you might be best suited getting in touch with Interhome. Their St Moritz office organised us a self-catering apartment for the week, which meant we could eat in, wash clothes and store bikes easily. Interhome also have a very broad range of properties that they manage. So whether you are a couple who want somewhere secluded for a few days, or a larger group who wants a big chalet closer to town, it is worth getting in touch to see what your options might be. Swiss alpine cuisine is often rich and cheesy, or based around meat. This is no bad thing after a big day out on the bike. But look to try some very Swiss fare, like a roesti, which grated potato that is usually pan fried to stick together. It’s often topped with cheese or ham. And the Engadin Nuss Torte should not be missed if you like desert. But overall, the quality of food and produce is very high in Switzerland, and you’re likely to eat very well. You will notice the Kiosk chain near train stations and bus stops. They are an excellent place to grab a quick coffee, chocolate milk or some chocolate bars – they can be quite a saviour on long days out! 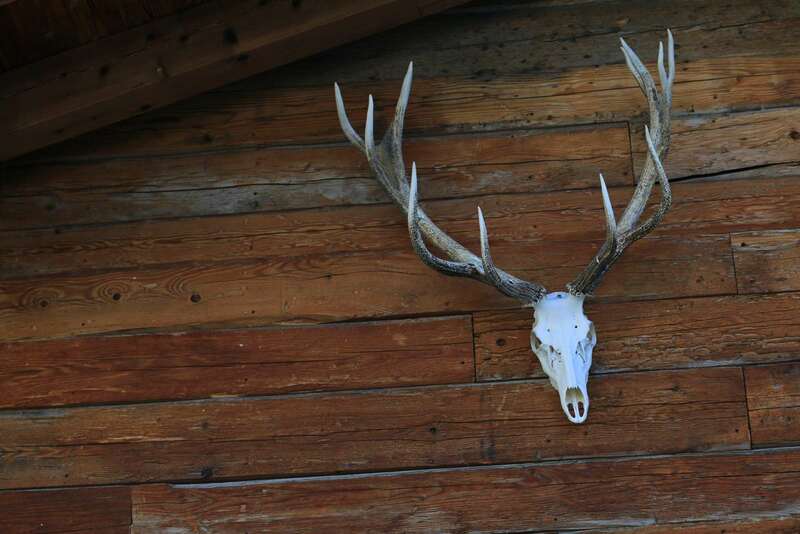 If you are on a big day in the mountains, do try to make a stop at a mountain restaurant. The food is usually very typical of the area, and excellent quality. It can be quite an experience having a delicious lunch somewhere in the mountains, at a point higher than anywhere in Australia.